King of Tokyo: Power Up! (2017 edition) is an expansion for King of Tokyo (2016 edition) by Richard Garfield, published by IELLO. It is for 2-6 players. 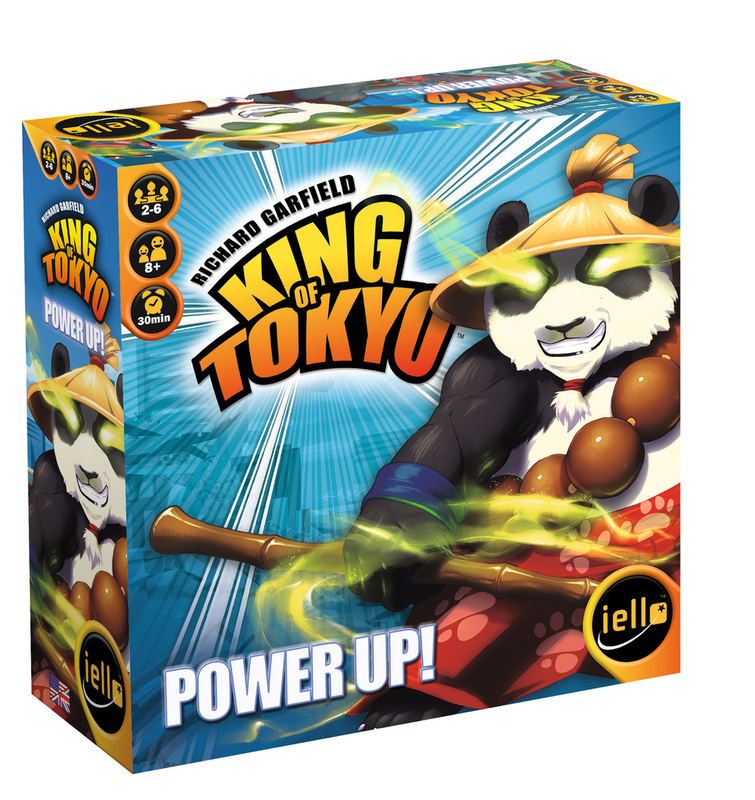 This expansion adds a new updated version of the Pandakai character, as well as adding Evolutions for the 2016 edition monsters of King of Tokyo. It also adds Evolutions for the Kraken and Cyber Bunny from the original edition, as well as several new tokens. For more information on King of Tokyo and how to play the game, please follow the link below. As I previously mentioned, this expansion adds Evolutions to the newest version of King of Tokyo. Before playing, each player should choose a monster and take the corresponding Evolution cards that belong to that monster. Each player should shuffle their cards and place them face down in front of themself. Players then draw the top 2 cards, choose one to keep and the other to discard. The discarded card is shuffled back into the deck. The player now keeps their chosen card in their hand until their ready to play it. The rest of the rules for setup and playing remain the same. For those who are unfamiliar with the game, let me give you a quick overview on what an Evolution card is and what it does. On a player’s turn, they will be rolling a set of dice, Yahtzee style. They’re allowed to set aside any they want to keep and reroll those that they would like to change. Once more, they can set aside dice and reroll for a final time. If they’re able to roll 3 hearts by their final roll, they can evolve their monster. What this means is the player now gets to draw 2 Evolution cards, just like they did when the started. They then keep 1 in their hand and discard the other one, only this time, the card isn’t discarded back into the deck. It’s placed in a discard pile, face down. Of course, the hearts that were rolled will still count towards healing the player’s monster, as long as it’s not in Tokyo. Evolution cards are kept in the player’s hand until they decide to play them, which can even be during another player’s turn. There are 2 types of Evolutions, Temporary and Permanent. A Temporary Evolution is discarded after it’s used. Permanent Evolutions remain face up in front of the player and continue to award the player with it’s benefits for as long as it remains in play. It should be noted that the game also comes with an updated version of the first edition Power Up character, Pandakai. This character has it’s own monster board and standee. I’ll discuss more about the updated look of the character in the components section. Also updated are the Evolution cards and tokens. The cards have some updated wording and names but still retain the same style backing as the Evolutions from the original version of this expansion. There are also Evolutions for the new characters introduced in the 2016 edition of the base game, Space Penguin and Cyber Kitty, as well as Evolutions for the Kraken and Cyber Bunny characters from the first edition game. There’s a lot to like about the components. 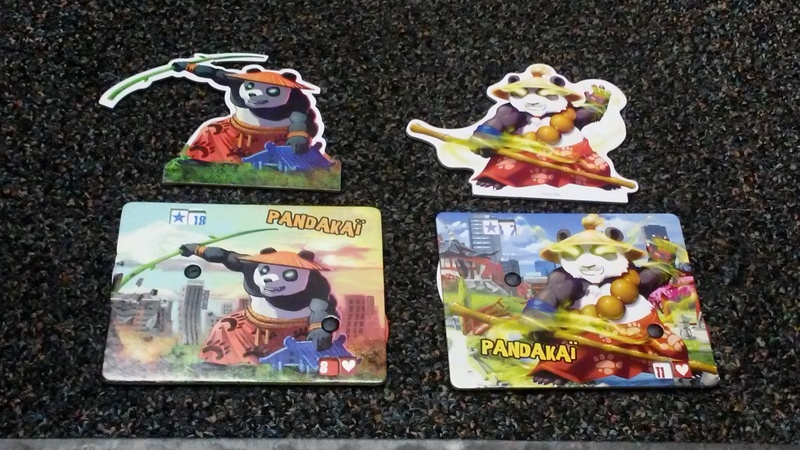 Just like in previous Power Up expansions, this expansion provides another playable character, Pandakai. However, this character should be pretty familiar to players of the older Power Up version of the game, as it’s pretty much the same character with an updated look. Granted, he looks a lot more menacing and fits in really well with the graphic design of all the other updated characters in the new 2016 version of the base game. Earlier I mentioned that the Evolution cards had been updated. Mostly it’s just a bit of minor word changing but nothing really graphically different. Nothing is really that much different as far as the actual Evolutions go in terms of gameplay. That said, what is new are the Cyber Kitty and Space Penguin’s Evolutions. I’m very happy to have these included with the game, as well as the updated versions of the original characters, Cyber Bunny and the Kraken. I’m super thrilled to have these as well. They easily could have been left out but the designer chose to give us original players a little something to make us happy too. The tokens received a bit of an upgrade graphically as well. Just like Pandakai, the tokens have new artwork that matches with the newer version of the game. Overall, I love the new look and feel of everything and am happy to have all the extras that this provides. The rulebook that comes with this expansion is small and fits easily inside the box. There are a couple of pictures but not much. The rules are all laid out really well and are easy enough to understand. There’s nothing difficult at all to read. To help, there’s also a full page dedicated to explaining the Evolution cards with illustrations. Also included on the back cover is a Mutant Evolutions variant for drafting Evolution cards before playing. It’s really nice addition and works really well too. Overall, I didn’t find anything to complain about as the rules do a nice job of explaining everything. If you know me, you know that my kids and I LOVE King of Tokyo. This expansion adds a bit more to the updated version of the base game. However, unlike the King of New York Power Up expansion, there’s not quite as much content this time. I will say that it’s nice to have the new Evolution sets as well as the updated version of Pandakai. He definitely fits in better with the new artwork for the 2016 edition. The Evolutions have been reworded to make things easier to understand and a bit better looking overall. 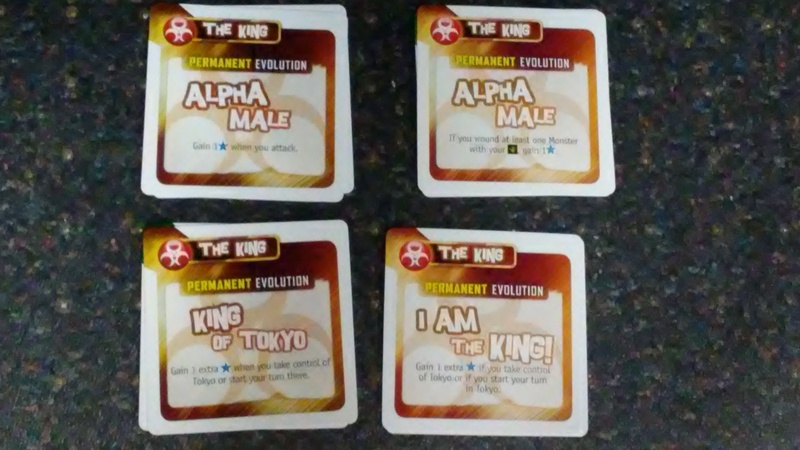 Some Evolutions have new names, such as The King’s King of Tokyo evolution has been changed to I Am the King. 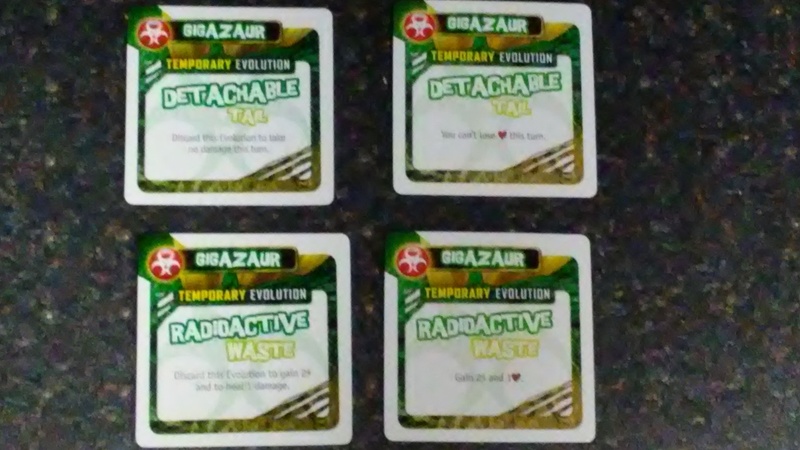 Evolution effects like for Gigazaur’s Radioactive Waste say, “Gain 2 energy and 1 Heart,” instead of “Discard this Evolution to gain 2 energy and to heal 1 damage.” Some of the cluttering wording has been removed in these cases. You can look a little closer at some of the differences in the Evolution pictures above. Overall, there’s not a lot of new material, most of it is simply cosmetic changes to match with the 2016 edition of the game. However for me, this is a must have as it gives Evolutions for the new Cyber Kitty and Space Penguin characters. In my opinion, it’s worth it just for those cards. Fans of the new updated version of King of Tokyo, will love this. For those with just the older version, it might not be such a big deal to them. However if you have both versions, you’ll want to get this for those 2 new Evolution sets. Overall I recommend this expansion. It’s definitely worth picking up a copy to me. King of Tokyo: Power Up! is an expansion for the 2016 edition of King of Tokyo, but also has content for the older version of the game as well. There’s really nothing new as far as game time or setup time. The artwork has all been updated to match with the new 2016 edition of the game. I really like the new look for Pandakai. It definitely looks like it fits in better with the game this time. The Evolutions have had a bit of a revamp as far as wording and names. Most of it is simply making things easier to understand and removing overused text. The new material is the Evolutions for Space Penguin and Cyber Kitty, but this also includes updated Evolutions for Kraken and Cyber Bunny from the original game. I’m very happy to have the new material, especially the Evolutions. Fans of either version of the game should be able to find something to like here. For me, it’s a must have. I’m sure that those with the new version or both versions will most likely agree with me. I recommend this expansion. The kids and I love it and I think you will too. This entry was posted in Reviews and tagged board, board games, card, card games, games, garfield, iello, iello games, king, king of tokyo, power, power up, richard, richard garfield, tokyo, up. Bookmark the permalink.